Located in a former general store in Hills, Iowa, Inspirations offers small-town charm and a gathering space for quilters. Shop owner Nancy Lackender and her husband transformed a 100-year-old building into a quaint quilt shop. Antique display pieces, patterns with historical connections, and reproduction prints set the tone at Inspirations. Front row, from left: Nancy Lackender (owner) holding Madeline Putney, Mary MacNeil, and Jo Young; back row: Adele Monserud, Sandra Irvine, Cassie Putney, Mary Ellen Timbs, Jessica Grout, and Anna Dizack. A stitched sample of Simply Rectangles from the book Just Your Style (Leisure Arts; 2012) by Midwest-based designer Gudrun Erla drapes over a cart holding precut fabric bundles and bolts of fabric. A mix of prints and color palettes makes a quilter’s visit to Inspirations a visual feast. A flower quilt that combines rickrack, yo-yo, and button embellishments can be found in the back room of the shop, which also houses bright fabrics. Hand-embroidered towels rickrack, embroidery floss, and other handwork supplies fill an antique cabinet. Shop owner Nancy Lackender designed Checks & Balances, a quilt featuring reproduction prints, for Quilt Sampler® Spring/Summer 2013. Kym Ward machine-quilted wavy lines diagonally in the Four-Patch units and curved lines following the seams of other block pieces. In the outer border, she stitched a feathered vine. 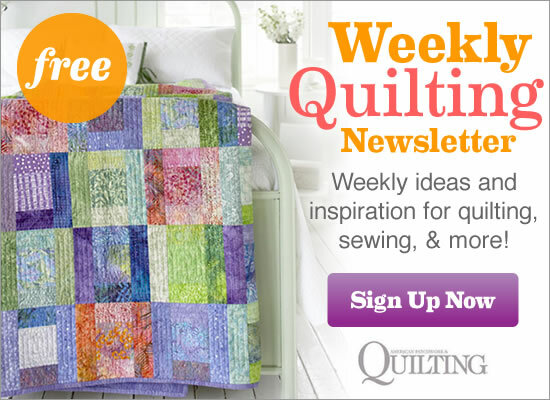 Contact Inspirations to purchase a copy of Quilt Sampler® Spring/Summer 2013 magazine, pick up a copy at your local quilt shop or newsstand, or get the digital issue online. Peek inside Keepsake Cottage Fabrics, another quilt shop featured in Spring/Summer 2013.